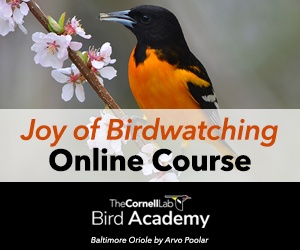 When the Cornell Lab of Ornithology invited bird watchers everywhere to go birding on May 9 and report their sightings for the first ever Global Big Day, no one knew what to expect. The results have exceeded all expectations! From Panama to Australia, India to Lithuania, participants enthusiastically accepted the invitation, tallying more than half of the world’s bird species. The numbers are still going up as participants continue to enter their lists through May 12.Black dots indicate where checklists were submitted for Global Big Day. The large yellow dot shows a new checklist dropping in. But the day also turned into something the numbers cannot capture. Global Big Day was defined by team efforts worldwide and was not necessarily about competitive goals or checking off species. It was about truly appreciating birds, unique habitat, and diversity—and about sharing the excitement of birding and the importance of conservation. Thank you to everyone who donated to support the Lab’s Global Big Day teams. There’s still time to make a gift toward bird conservation—the other driving force behind this event. Black dots indicate where checklists were submitted for Global Big Day. The large yellow dot shows a new checklist dropping in. Every country in Central America participated, along with 16 countries in the Caribbean. In Panama,Sociedad Audubon de Panamá mobilized teams nationwide, with 84 birders posting over 650 checklists and 620 species, almost two-thirds of the country’s species! Prominent and luxurious birder destinations including the Canopy Family (Canopy Tower, Canopy Lodge, Canopy Camp, and Canopy B&B), Los Quetzales Ecolodge and Spa, and Tranquilo Bay Eco Lodge also mobilized teams to participate in Global Big Day, hosted Cornell Lab staff in the lead up to the Big Day, and provided amazing logistical support. Every one of them provides a great birding destination for visitors to Panama and is highly recommended. BirdLife Zimbabwe did a great job with the event and birders there have contributed 232 species, one of the highest totals from a country in Africa so far. Team Sapsucker in Panama (L-R) Carlos Bethancourt, Chris Wood, Jessie Barry, Tim Lenz, Marshall Iliff. Photo by Carlos Gómez. “On Global Big Day, we were Panamanians,” says Chris Wood, captain of the Cornell Lab’s Team Sapsucker and co-leader of eBird. He and four others on the team reported 320 species during the day, reveling in an exceptionally warm welcome from a country that may be small geographically but is super-sized when it comes to diversity of species and its importance to birds throughout the Western Hemisphere. For the Sapsuckers, birding in Panama was an eye-opening experience. Their day began at midnight at home base, the Canopy Tower Lodge. The first bird they heard was a Mottled Owl followed by a Great Tinamou and a Black-and-white Owl. Pre-dawn birding included one of several life-birds for the team, a Rufous Nightjar, along with Capped Heron and Boat-billed Heron. Daylight brought humidity and temperatures in the nineties. The team spent 2 hours on the famously birdy Pipeline Road, which is really a dirt track through the forest. They bounced along in the so-called “BirdMobile” supplied by their Canopy Tower hosts and driven by Domi Alveo. Having Canopy’s Tower’s Carlos Bethancourt on the team was another eye-opening experience, notes Sapsucker Marshall Iliff. “Carlos’s knowledge of Panamanian species and his ability to find them and recognize their sounds is extraordinary,” says Marshall. “We felt truly humbled!” For example, Panama boasts about 100 species of flycatchers alone, each with slightly different whistles and trills. The Sapsuckers counted 39 of them. Following the Pipeline Road. Photo by Carlos Gómez. The entire day was punctuated by memorable moments as the team moved from tropical rainforest to marshes, highlands, and rice fields. Imagine having a Spectacled Owl fly by so closely you can feel the wind from its wings; having a Pheasant Cuckoo perch at eye level along the Pipeline Road; floating down the Chagres River to discover 40 super-rare Masked Ducks; hearing the spine-tingling “roar” of a Rufescent Tiger-Heron at night while Panamanian night-monkeys cavort in the trees. For Sapsucker Tim Lenz, the highlight was seeing dozens of hummingbirds jockeying for position at backyard feeders in the Cerro Azul development northeast of Panama City, including male Rufous-crested Coquettes with their punk-rocker hairdos. After being dazzled by so many new species the Sapsuckers say they finally “felt like competent birders” again when scoping the bay at Panama City where a large proportion of the global population of Western Sandpipers winters, along with other familiar Arctoc breeders such as Black-bellied Plovers, Whimbrel, and Short-billed Dowitchers. “Inspiration” is another word that keeps coming up. Every step of the way, the Sapsuckers say they were inspired by the efforts of participants around the world and the phenomenal levels of participation in Global Big Day which they could follow in real time on the eBird website. For the state Redheads team and everyone else, finding birds was hampered by thick fog. L-R: Ben Barkley, Luke Seitz, Brendan Fogarty, Benjamin Van Doren. Photo by Andy Johnson. The Big Day spirit of cooperation was also evident at the 32nd annual World Series of Birding in New Jersey. Teams were allowed to share information for the first time and it served everyone well as they all struggled with persistent fog, a bit of rain, and migrant species that vanished overnight. Three teams made up of Cornell University students, collectively called Team Redhead, competed in the event’s state, county, and Big Stay divisions, registering stellar performances across the board. The state team, made up of Barkley, Andrew Dreelin, Brendan Fogarty, Luke Seitz, and Benjamin Van Doren, totally upended the traditional birding route, starting the day with a Northern Mockingbird in the Meadowlands. But the real highlight was hearing a bird that’s been missing from World Series tallies for years: the secretive Black Rail, a find made possible after another team shared the bird’s location. The state Redheads team defended last year’s championship title, bringing home the Urner Stone Cup for the highest species total: 208. They happily shared the title with a Maryland youth team called the Raucous Gulls. Although technically not eligible for the award, the youth team tallied 216 species. The Redheads team that birded Cape May County included Teresa Pegan, Eric Gulson, Mary Margaret Ferraro, and Max Witynski. They were very happy with their tally of 148 species which put them in second place in their division. The Big Stay team, which did its birding in one location, won its division by just one species, reporting 71 in all. Sarah Dzielski, Lauren Flesher, Nathanial Hernandez, and Reid Rumelt made up this team and were thrilled to include a Mississippi Kite in their final tally. The Swarovski Carbon Footprint award is shared by two teams, one of them the CMBO Birds and Blooms Scarlet Knight Herons which was raising funds for the Cornell Lab with its efforts. The team of David La Puma, Don Freiday, Timothy Freiday, Jessica Gorzo, and Bill Lynch identified 126 species as they did their birding without the use of a motorized vehicle. Way to go! For the Cornell Lab of Ornithology, Big Days have traditionally been a means of raising funds to support its programs in education and conservation and to assist with undergraduate research through the Redhead Fund. This year was no different. Thanks to the generosity of supporters we are closing in on $300,000 toward our goal of $500,000 (so please consider donating to help our cause). 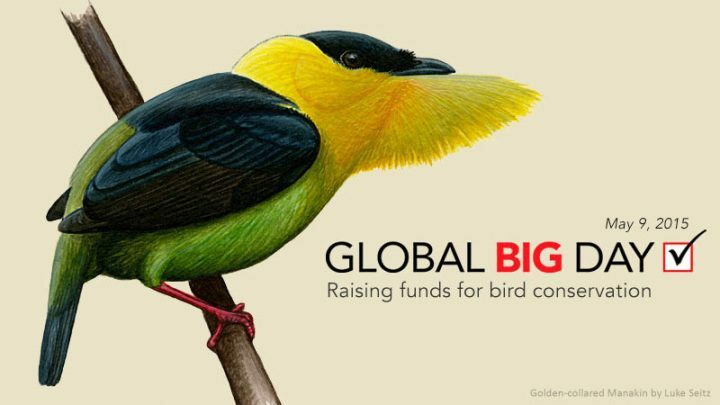 As participation in Global Big Day grows, the hope is that conservation groups in other countries will find the event a useful way to bring in funds for their important work as well. An extraordinary talent: Sapsucker Carlos Bethancourt. Many thanks to all who have supported Team Sapsucker and Team Redhead this year and who participated in Global Big Day. And an especially heartfelt “thank you” to Raul Arias and the entire Canopy Family for their tremendous hospitality during our team’s visit to Panama. Thanks to drivers Domi Alveo and Lorenzo Ibarra; to Jenn Sinasac who coordinated the entire visit; to Rosabel Miro and the staff at Panama Audubon; to eBird reviewers Jan Axel and Darien Montañez; and to the incomparable Carlos Bethancourt. “Carlos was clearly the most valuable member of Team Sapsucker and personifies the rare combination of traits one looks for in the very best leader, conservationist, guide, and friend. Carlos—you will always be a Sapsucker!” says Chris Wood.